Journalist & Face of Whats Up Africa? 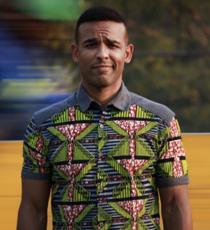 Creator, writer and presenter of What’s Up Africa – the first satirical comedy news show on BBC World News television. What’s Up Africa is broadcast twice weekly on BBC World News and is in its 5th season on BBC. The show was nominated for an Association of International Broadcasters’ award in 2015 and continues to grow in popularity. Previously a City lawyer, Ikenna now has 7 years of experience as an Africa-focussed commentator and online/television presenter. He was cited as one of the 100 Most Influential Africans 2014 by New African magazine. Ikenna graduated in Law and French law from University College London.